The cruise we choose was based on the destinations and the extension available, Downton Abby. The cruise was a dream trip visiting many ports of historical interest that added to the overall experience of this trip. We were accompanied by good friends that added to the experience and added many laughs and good times that will never be forgotten. The end of or cruise was in Paris and a real highlight for us was a trip to the very top of the Eiffel Tower at night, the views were spectacular and the experience was breathtaking. The trip to Oxford England and Downton Abby is one that we will never forget. The guides were very well informed and added a great deal to this experience. There were several surprises along the way including a welcome toast by the dutchess at the Abby. Overall Viking out did themselves with this trip from beginning to end and their professionalism came through by the individuals they had to take care of use at each step along the way. The cruise we choose was based on the destinations and the extension available, Downton Abby. The cruise was a dream trip visiting many ports of historical interest that added to the overall experience of this trip. We were accompanied by good friends that added to the experience and added many laughs and good times that will never be forgotten. The end of or cruise was in Paris and a real highlight for us was a trip to the very top of the Eiffel Tower at night, the views were spectacular and the experience was breathtaking. 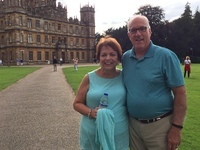 The trip to Oxford England and Downton Abby is one that we will never forget. The guides were very well informed and added a great deal to this experience. There were several surprises along the way including a welcome toast by the dutchess at the Abby. Overall Viking out did themselves with this trip from beginning to end and their professionalism came through by the individuals they had to take care of use at each step along the way.